There are two things to remember when sealing seams. 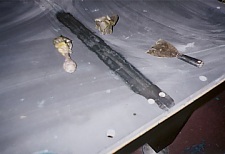 First, the slate must be flat, level and in its permanent position. Any slate or table movement from this point on may break the waxed seam that you have worked so hard seal. Second, make sure the slate is at least room temperature or warmer. Wax doesn't adhere to cold slate very well. Use a propane hand torch to pre-heat the seam, then drip wax onto the seam and spread it evenly as shown in the picture (illustration 1). I usually spread the wax 1 to 2 inches on each side of the seam line. Let the wax cool for about 30 seconds then scrape the wax off with a paint scraper. Be sure not to let the wax cool too long. It will harden quickly, which makes it very difficult to remove. Once your wax is removed, use your fingers to feel the seam for any inconsistencies. The basic function of the wax is to make the seam disappear as if where never there. You should not be able to feel any edge, dip or bump on the seam. Also, remove as much wax as possible from the table. Excess wax will work its way into the bottom of the cloth, which may later create a line or discoloration. You are now ready to put the cloth on your table. Clean the surface with a damp rag then use your bare hands to sweep the entire surface. Your hands will pick up any inconsistencies on the slate. This small step is critical, there is nothing worse than finishing your table and then discovering a small splinter of wax or wood under your cloth.